Start the Day Off Right: Blueberry Muffins! | Delicious! Delicious! Start the Day Off Right: Blueberry Muffins! Caryn sits on the floor outside the door, talking on her cell phone. I think we only have a few more days here and then we’re off again. Matt flips through a car magazine as Punky bathes himself on the couch next to him. You know, I’ve switched over to reading Chocolate and Zucchini. She updates more often. Ha, ha. We have a day off today, so I’m working on another entry. Loud laughs are heard from the door behind her. I gotta go. I’m sure they’ll be crying for their breakfast any minute now. She snaps the phone closed and stands up. Mr. R., Lauren and Miss A. are gathered in the living room of a suite that could pass for a small house. Hard to believe his room and Caryn’s are even in the same hotel. 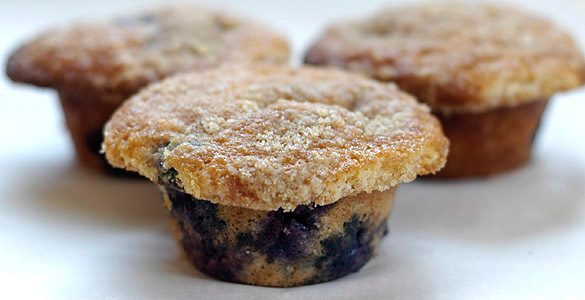 Caryn enters and heads straight for the kitchen where her streusel-topped blueberry muffins are cooling. She carefully lifts each one out of the pan and lays them in a linen-lined basket. It’s so nice to have a day off. These six-day weeks are too long. I’d rather shoot the whole movie straight through and head back to LA as soon as possible. Caryn places the basket of muffins on the table and pours coffee. Come on, Lauren. Everyone needs time off. What should we do today? Miss A. takes a muffin and tears it open. Hot blueberries leave deep blue stains on her fingers. Maybe Caryn can pack us a lunch and we’ll sight-see. No one reacts to the suggestion, so she tries again. Or we could plan a little dinner party here! Lauren casually looks up at Caryn from her caffeine fix. We could do that. Some of the people on the movie. Maybe twelve? Mr. R. opens the paper as he picks streusel off the top of his muffin. Caryn, you can put that together for this evening, right? Okay then. We’ll relax around here today and have a few people over tonight for an easy dinner. Everyone seems content. Mr. R. immerses himself in the morning news, Miss A. takes another muffin and Lauren enjoys her second cup of coffee while she skims some paperwork. Caryn heads back to the kitchen, muttering under her breath. These muffins are incredibly moist and tender. Make sure that the streusel topping is light and crumbly before sprinkling on tops, or it will sink into the batter. When working in a warm kitchen, keep the topping cool by temporarily storing it in the fridge. 1. Preheat oven to 375 degrees. Generously grease 12 muffin cups. 2. To make streusel: place flour, brown sugar, sugar, butter and cinnamon in a small food processor. Pulse until coarse crumbs. Keep cool until batter is ready. 3. Mix together flour, sugar, baking powder, baking soda and salt. 4. Whisk together eggs, butter, vanilla and buttermilk. Add flour mixture to buttermilk mixture, stirring just until moistened. Batter will be lumpy. Gently fold in blueberries. 5. Fill muffin cups with batter until level with edge. Sprinkle streusel topping over batter. 6. Bake until golden and toothpick inserted in center comes out clean, about 20-25 minutes. Muffins will be very tender when warm. Carefully loosen edges with a spatula when slightly cool. It’s okay to cool muffins in pan until they are stable enough to handle. Yield: 12 muffins with over-sized tops. Oh how inconsiderate! A part of me hopes she “accidently” puts too much chili powder in the entrée or something … Those muffins look fab though, and it seems we must be on the same culinary page. I was planning on attempting to turn this cake into muffins this week. Maybe I’ll just make yours instead. Shoot. The link doesn’t seem to work. It is the Peach Streusel Coffee Cake from the Williams-Sonoma website. yum, those look downright yummy!!! very nice photography you’ve got here. and the recipe is similar to my favorite blueberry muffins, except mine uses yogurt. maybe i’ll try yours! thanks! You’re living a dream!!! Been lurking for ages. Had to let you know that your writing and recipes really make for interesting reading. I so enjoy you!!! I have a lemon/blackberry muffin recipe that men faint over. Let me know if you want it. Hi Caryn…beautiful muffins and great writing, as ever! When is Caryn going to stand up for herself and get what she deserves (i.e. a day off!)? I am defiantly going to have to try this recipe out! I am starting my own food blog, and I am enjoying all the other food bloggers out there. Would you mind if I put a link to your blog onto mine? I like your site, and the pictures are wonderful. Waiting not so patiently for the next installment, and the next recipe. I am addicted and here you are keeping me hanging. AHAHHAHAHA! Doesn’t that peach cake look fantastic?! Make it and let me know how it turns out! Thanks so much for all the pushy comments and emails asking me to update. I guess y’all are the reason that my sight traffic never seems to drop, despite the fact that I haven’t updated in weeks. I’m finally working on the next entry and will post very soon. I *think* I’m back on track now. THANKS for all the support! if i eat one of these in every morning, i will die!